Homemade is always better, so why not try your hand at pizza? A delicious weekend meal. Make your own crust or buy the frozen dough and follow their directions. Making the Crust: Add all dough ingredients to a large bowl and knead until smooth – takes about 5 minutes. Place in a lightly oiled/buttered bowl, cover, and let rise for about one hour. While it is rising, lightly oil or spray a pan (if you have a deep dish pizza pan, that’s great, but not everyone does, so make do with what you have) – it needs to have sides at least 2″ high. Stretch the dough and lay it in the pan, it may shrink back somewhat but stretch to cover bottom and up sides – if you see the oil seeping/oozing out, don’t worry, just ignore it and keep going; cover and let it rest for 10 – 15 minutes. While it’s resting preheat your oven to 425 degrees, and start making the sauce. 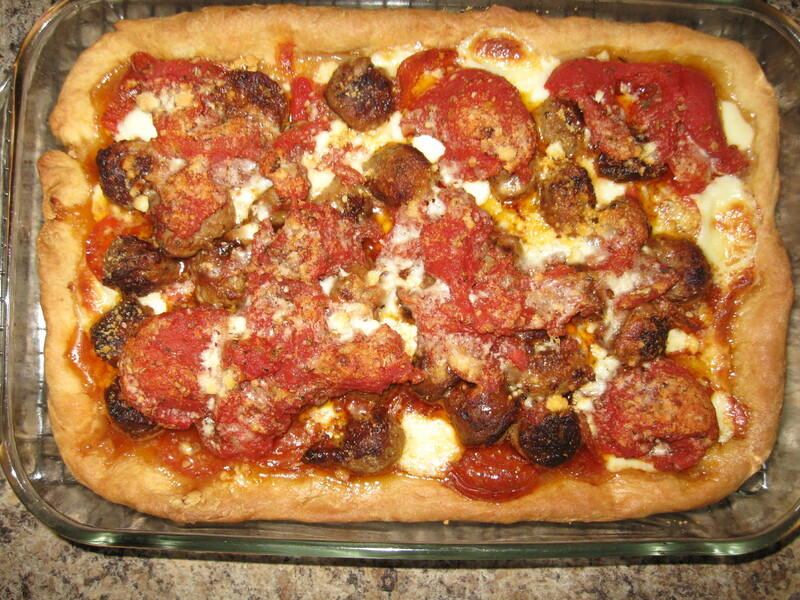 Bake crust for 15 minutes, or until its very lightly browned, remove from oven and set aside. Making the sauce: Drain the tomatoes, place in a large bowl, and with your hands carefully squish them – keep hands in the bowl or you’ll be wearing the sauce! Add the herbs, garlic, and sugar. 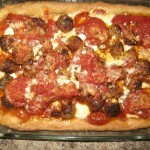 Place all the slices of mozzarella on the bottom crust, add the slices of sausages, then add the tomato sauce. Sprinkle on the grated cheese then drizzle a little bit (like about 1- 2 Tbs.) olive oil onto top. Bake for about 25-35 minutes, or until filling is bubbly and top is golden brown. Let rest about 20 minutes.